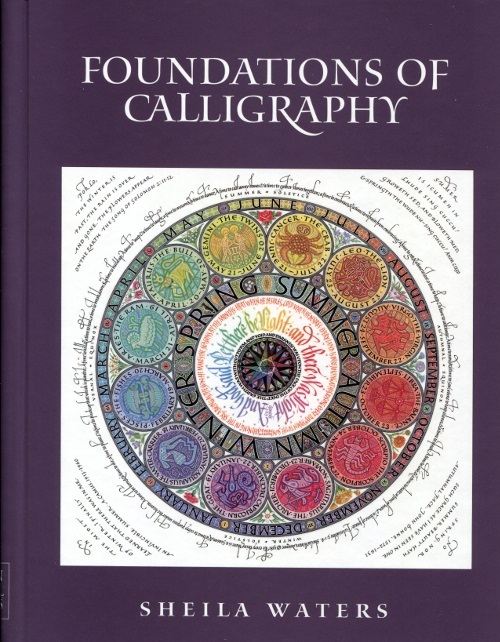 This page contains summary reviews of the Calligraphy & Illumination books in my library. I've listed them in a rough order of how useful I find them. If available, the title will link to a detailed review post where I review the book chapter by chapter. Scroll to the bottom of this page for a detailed explanation of the ratings. Out of Print - ISBN-13: 978-1564588494 - Check scribd.com for a PDF copy. Sadly, this book is out of print and becoming harder to find. I attempted to contact both the author and publisher last year to ask if they have plans for a second edition or reprint, and received no response. If you wish a physical copy, act quickly. You can still find gently used copies for sale at reasonable prices for the time being. Otherwise, there are questionably-legal ways of getting a digital copy online through services like scribd.com. If you get yourself a free copy this way, and the book does become available again, please buy it to support the author. If you are just starting calligraphy and are looking for information on how to start, you will likely be a frustrated with Harris. While he does have a short section discussing tools, there's nothing on how to use them. 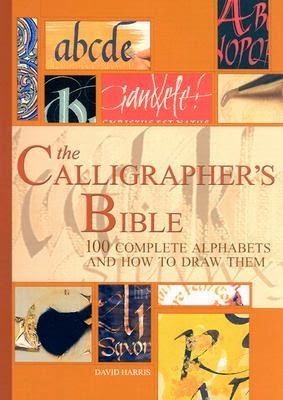 This book assumes to assume you already know how to use a calligraphy pen. If I could talk Harris and the publisher into developing a second edition, I would ask them to add a chapter on writing slope setup and how to use and become proficient with a calligraphy pen. 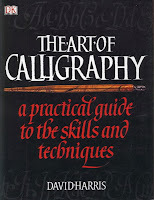 Every calligrapher in the SCA should have a copy of this book on their bookshelf. 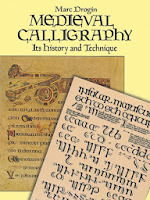 It's inexpensive, full of a detailed history of medieval and renaissance scribal development, contains numerous examples of different period scripts with a simple ductus for each, and includes some practice exercises for the new calligrapher to start with. While Drogin does a great job at providing some practice techniques for beginners and his ductus is good at breaking down letters into their component strokes, this is a pretty dense book for a beginner who just wants to focus on picking up a pen and learning how to use it. The first 75 pages are dedicated to the history of calligraphy. The quality of paper and black and white images aren't as nice as some more recent books, but where it lacks in flash, it more than makes up in content. If you are a student of medieval calligraphy and don't have this book, get it. If you own it, and haven't read it in the past year, read it again. This book would be an excellent addition to the library of any serious student of calligraphy who wants to improve their skills. Waters does a superb job of teaching how to be an analytical calligrapher: both in how to examine a hand to learn how to reproduce it, as well as common mistakes in the formation of different scripts and how to prevent them. This is a skills focused book that is written with the beginner/intermediate calligrapher in mind. The chapters are ordered such that they help guide a novice calligrapher, generally starting with easier scripts and progressing to more difficult. It is dense, and will probably provide more benefit to someone who is comfortable with the pen and a couple alphabets already. While she includes some decent notes on the history of the scripts, you'll have to look elsewhere for detailed history and high quality extant examples of medieval calligraphy. 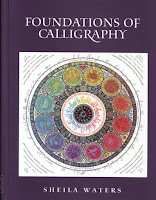 The focus of this book is on the skills, knowledge, and techniques needed to become a better calligrapher. This is a very useful quick-reference book to have open next to you while you work. Of the 100 alphabets included, 38 are based on period examples, with several more still providing useful inspiration for a medieval-focused calligrapher. Mary Noble writes the Preparation section, which has some helpful information on tools, pratice, workspace and layout for the new artist. Janet Mehigan provides a chapter on how to decorate in period style using gold leaf and paint. The small format & spiral binding makes for a portable book that stays open and lays flat when in use. Each alphabet has instructions on the angle(s) of the pen and how the major strokes are formed. It contains enough period script references that you could pen almost any scroll for the SCA. It includes multiple styles of uppercase letters to use with various period hands. It contains a significant number of non-period (modern) hands. The period hands are usually limited to the modern letter forms, typically excluding the tall-s and half-r. It doesn't contain any images showing which scripts pair with various illumination styles. 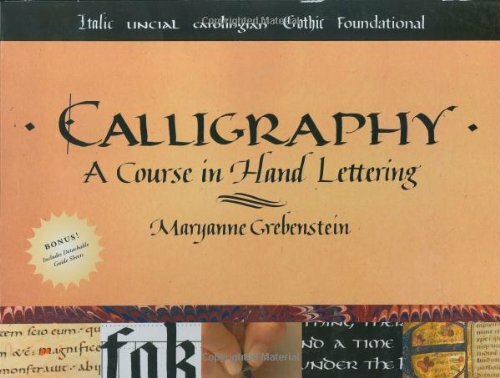 This book is a great resource for a calligrapher who likes to pen different scripts, and needs to do so at a moment's notice. My personal preference is to learn and work from original documents as much as possible. Still, this book is one I usually keep with me when I travel due to its convenience and utility. As far as I'm concerned, every serious student of medieval and renaissance calligraphy should have this book in their library. A very useful book, definitely worth having in your library. Useful for any areas it covers in detail. Maybe worth purchasing for an area it focuses on, but there are better choices out there. I don't think this book is worth buying. Images of Period Examples – Quality images of period documents, specifically showing a calligraphic script with enough detail that you could attempt to replicate it. Historic & Paleographic Knowledge – Information about the history of the various scripts: where, when, how, why & by whom they were developed. Ductus/Instructions on Historic Scripts – Detailed examples and instructions on how to form the letters of the scripts. Accessibility to Novice Calligraphers – The amount of information helpful for someone just starting calligraphy. Introduction to tools and materials, how to hold and use different calligraphy pens, etc. Techniques for Left-Handed Calligraphers – Methods for left-handed calligraphers to hold the pen and produce letters that appear the same as those produced by a right-handed calligrapher. Illumination Techniques - Information on how to apply gold leaf or shell gold. This book is worth buying for this category alone, and covers it in incredible detail. This book has a serious focus on this type of information. There's enough information on this category to get by with. Minimal information on this category is available. Very little information on this category is available.